By 1692, Chamberlayne’s Present State of England had been through seventeen editions, and there had been a change of monarch. Charles II died in 1685 and was succeeded by his brother James II (1633-1701). James, in turn, was replaced after the Glorious Revolution in 1688, by his nephew and his daughter, William and Mary, who had married in 1677. In the frontispiece of the 1692 volume, here, King William III (1650-1702) and Queen Mary II (1662-94) sit upon their thrones, holding their own royal sceptres but sharing the monarchical orb. 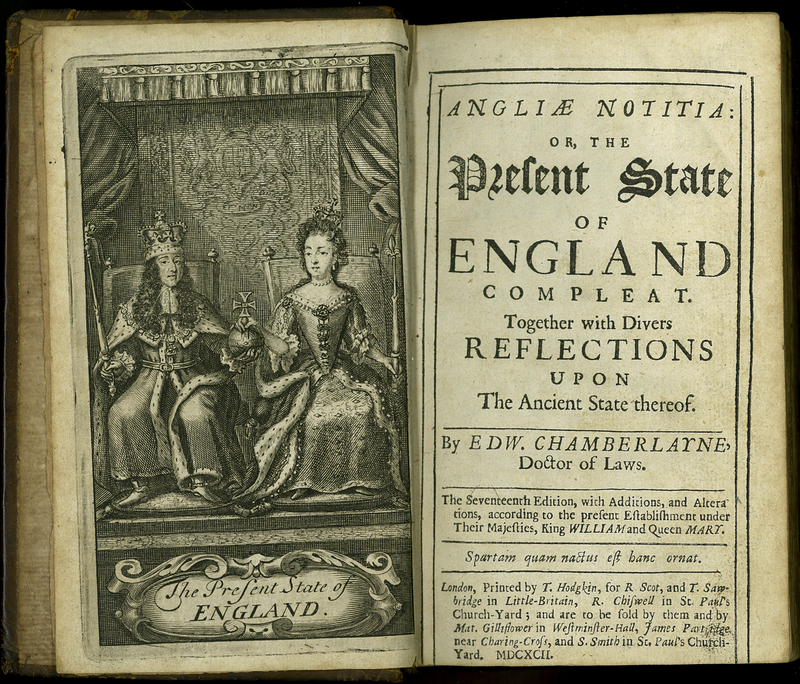 Edward and John Chamberlayne, “Angliae Notitia: or, the Present State of England Compleat. Seventeenth Edition,” ourheritage.ac.nz | OUR Heritage, accessed April 20, 2019, http://ourheritage.ac.nz/items/show/10682.